(AP) AKCAKALE, Turkey - Rebels seized control of a border crossing on the frontier with Turkey on Wednesday, pulling down the Syrian flag and briefly allowing people - some jubilant, some wounded - to crawl under a barbed wire barrier between the countries. Turkish authorities quickly closed the area and police prevented the crowd from trying to storm the border and cross into Syria. "I am a free Syrian!" shouted Zisha Bargash, throwing his hands in the air, as he watched the takeover from the Turkish side. "This is the beginning of the end Assad. Game over." A crowd of about a dozen people who managed to cross from Turkey to Syria hoisted a rebel flag to replace the national flag, sparking loud cheers and applause. Syria's rebels have captured several other border crossings into Turkey, as well as one into Iraq, but Wednesday's seizure of the Tal Abyad post is believed to be the first time they have overrun a frontier post in the northern province of Raqqa. Capturing such border crossings provides a strategic and logistical boost to the opposition, allowing them to ferry supplies into Syria and carve out an area of control, which is key as the rebels try to tip the balance in the civil war. Wednesday's takeover comes after a day of fierce clashes as rebels and regime forces fought for control of the Tal Abyad crossing. Turkey's private Dogan news agency said earlier Wednesday that the rebels had surrounded the customs building and engaged in an intense fire fight with Syrian sharp-shooters positioned in the building. Several people were wounded in the battles and were taken to Turkey for treatment, the report said. 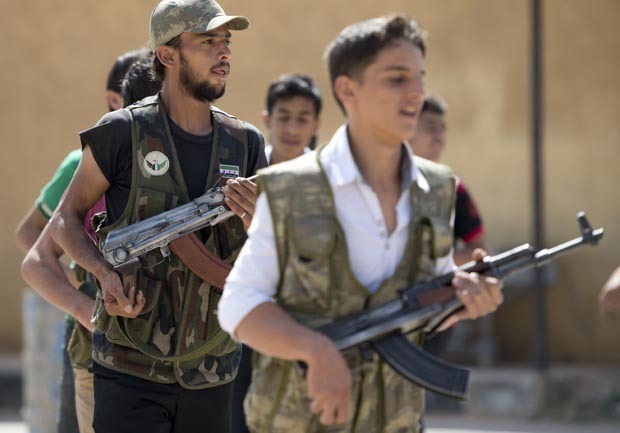 Civilians escaping the violence reported that several people were killed in the fighting around Tal Abyad, Dogan reported. The 18-month conflict between the regime of President Bashar Assad and his opponents began with peaceful protests that were attacked by government security forces, and has since evolved into a civil war. Activists say at least 23,000 people have died, many of them civilians who fell victim to the regime onslaught, although rebel factions have also been accused of summary executions and other abuses. The conflict has sent refugees pouring into neighboring countries. Some 83,000 refugees have found shelter in 12 camps along the Turkish border with Syria. Also Wednesday, Amnesty International said the Syrian government has carried out indiscriminate air bombardments and artillery strikes on residential areas that do not target opposition fighters or military objectives, and instead appear aimed solely at punishing civilians seen as sympathetic to rebel forces. Much of the recent fighting has centered on the contested city of Aleppo, but the London-based group said hundreds of civilians in other parts of northern and central Syria have been killed or wounded in recent weeks, many of them children, in attacks that struck people in their homes, in the street or while trying to take shelter from the bombings. The conclusions were published in an Amnesty report that followed a visit to Syria by senior crisis researcher Donatella Rovera, who traveled to 26 towns and villages in the Jabal al-Zawiya area and other parts of the northern Idlib and north Hama regions between Aug. 31 and Sept. 11. Meanwhile, military prosecutors investigating the downing of a Turkish plane by Syria said initial findings show Syria targeted the plane with a long-range missile while it was in international air space. The report carried by the state-run Anadolu agency on Wednesday backed Turkish government claims. Syria has insisted the plane was hit by anti-aircraft artillery while flying low in Syrian air space. The report says radar data and an inspection of the wreckage show the plane was not hit, but that it lost altitude and crashed from the power of a missile blast near its rear. The plane went down in the Mediterranean Sea near Syria, killing its two pilots. The June 22 incident further strained ties between the two neighbors.